"When the brothers gate-crash a ladies lunch." Anil Kapoor made Sunita Kapoor's birthday special not only with the heart-warming Instagram posts but also with a surprise visit to her birthday lunch. LOL. Anil Kapoor and brother Sanjay Kapoor admittedly "gate-crashed" Sunita Kapoor's birthday lunch and looks like the ladies didn't mind at all! On Instagram, Sanjay Kapoor shared a glimpse of the lunch party and wrote: "When the brothers gate-crash a ladies lunch." 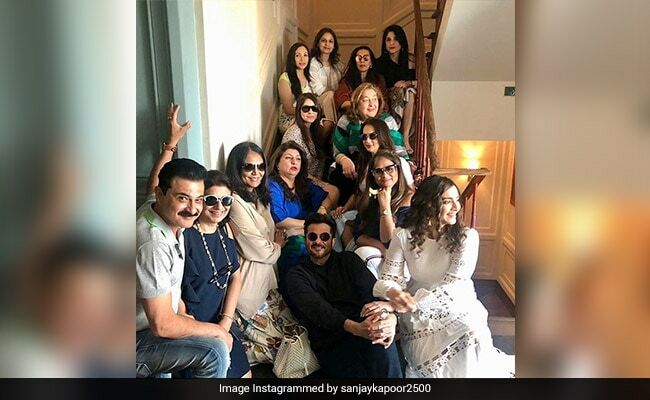 Apart from Sanjay Kapoor, Anil Kapoor and Sunita Kapoor, the photo also features Sonam (Anil and Sunita's daughter), Maheep Kapoor (Sanjay Kapoor's wife), Bhavna Panday (Chunky Panday's wife), Seema Khan (Sohail Khan's wife) and Rima Jain (Rishi Kapoor's sister). The Kapoors celebrated Sunita Kapoor's birthday with a dinner and close-knit party on the eve of her birthday. "Jiyo hazaro saal," sang everyone as Sunita Kapoor cut her birthday cake. On her birthday, Sunita Kapoor received adorable birthday wishes from her daughters Sonam and Rhea. "You have always been the ultimate role model, supporting me and helping me stand taller against whatever I may face in my life," wrote Sonam while Rhea added: "Happy birthday to my conscience, oracle and constant challenger." Happy birthday to my conscience, oracle and constant challenger. I know you keep me grounded, sane and make me a better person. I don't know how they do it but moms make you fly and put you in your place at the same time. I love you mommy happy birthday! But Anil Kapoor's birthday post for wife Sunita took the cake. "This is what being young and in love looks like! Every day of my life is made better because of her," he wrote along with a throwback photo. Anil Kapoor married Sunita Kapoor in 1984 and they are also parents to Harshvardhan Kapoor, also an actor.